Noticed while working on the ​Settings API enhanced. 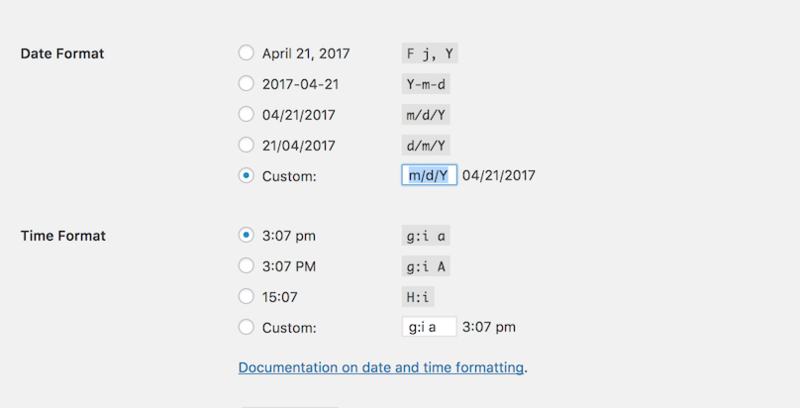 When using a keyboard and trying to set the Date and Time format, users get "trapped": when focusing the custom format field. While this may make sense when using a pointing device (mouse or similar), it's a huge barrier for keyboard and screen reader users. Since the fix is simple enough, I'd propose this ticket for 4.7.5 consideration. 40515.diff​ (1.2 KB) - added by afercia 2 years ago. Patch works like a charm. +1 from me. Would it make sense to disallow tabbing into the input fields unless the 'Custom' radio button is selected? From an a11y perspective, yes. But for mouse users that would require an additional click? Accessibility: Avoid a keyboard trap on the date and time custom format settings. the original functionality when using any kind of pointing or input device.